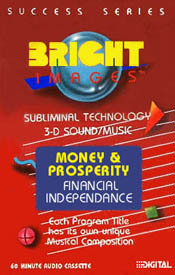 This program was designed to inspire a person with unique qualities and specific strategy neccessary to reach successful in life. Recieve powerful affrimations to improve your attitude and to stimulate your inner talent, potential success, intelligence and your ability to obtain whatever you desire. Using your new positive attitude and brilliant strategy to built a harmony from within that will enable you to make quick , accurate and positive decisions that follow your plan for success. Designed to enhance your intelligent ability and brilliant strategy to develop into a road map of abilities to meet your goals. Building confidence in your ablilities taht you have exactly what it take to accomplish your plan for a successful future.